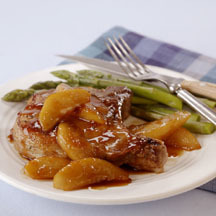 CooksRecipes has quality, kitchen-tested recipes for pork chops made with fruit that you can count on for successful deliciousness. 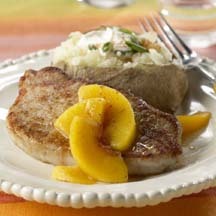 The spicy coating on the pork chops marries well with the peaches. Consider this skillet dish for a comforting, down home meal. This one-skillet dish is a perfect pairing of pork and braised fruit, with a hint of soy sauce and a pinch of cayenne. 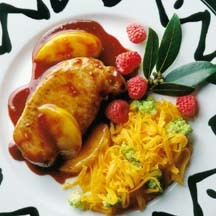 Spicy barbecue sauce makes a match with fruit and pork chops for a quick skillet supper.